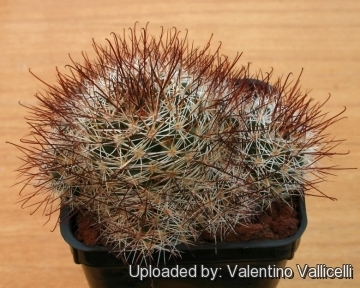 Accepted Scientific Name: Mammillaria multihamata Boed. 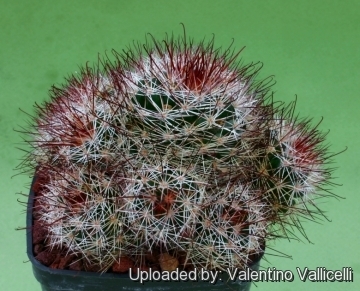 Origin and Habitat: Mammillaria marcosii is endemic to Guanajuato, Mexico, where it is found east of Xichú (El Guamúchil, Xichú to El Guamúchil to Atarjea) and grows over a range of less than 10 km². The current population is estimated to be less than 150 individuals. Altitude range: This species is found at an altitude around 1,200-1,400 metres above sea level. Habitat and Ecology: This species is found on steeply sloping volcanic rocky terrain in semi-desert (submontane matorral). Generation length is 5-10 years. This species is threatened by extensive illegal overcollecting. The habitat is now well known to both commercial and amateur collectors. The population has diminished by an estimated 90% due to illegal collecting and there is continuing decline of mature individuals. 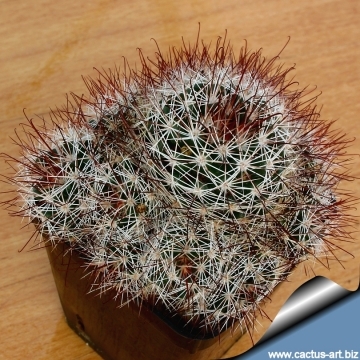 Description: Mammillaria marcosii is a small cactus that readily forms irregular clumps with dense spination. In habitat the clumps may grow up to 25 cm in diameter, with up to 30 heads. The spines are bicoloured (usually red and white, but they may occur in a wide range of colours). Derivation of specific name: This member of the Cactaceae family was given this name in by the Mexican cactus grower Marcos Sierra Pichardo from the city of San Miguel de Allende, who discovered the species. Stems: Low, round to short cylindrical, up to 5 cm in diameter. Without latex. Tubercles: Soft, cylindrical, with round tips. In the axil there is wool and up to 15 bristles, up to 15 mm long. Radial spines: 16-25, radiating, needle-like, straight, 4-12 mm long. 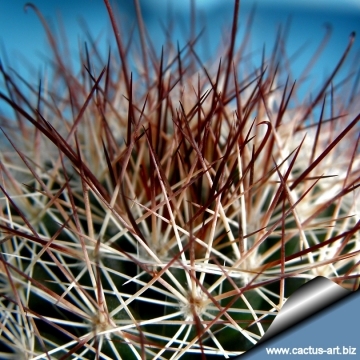 Central spines: 7-14, mostly needle-like, radiating, ascending, white, yellow, reddish brown or brown, 10-20 mm long, one of which is pointing downward and more or less hooked, all others straight. Flowers: Bell shaped, to 15 mm long and up to 10 mm in diameter, not rising above the spines, yellowish or creamy-white, with pink throat and darker pinkish midrib, stigma pale yellow. Fruits: Red, egg-shaped, 6 - 13 mm long, not arising above the spines. 1) Fitz Maurice, B, Fitz Maurice, W.A., Guadalupe Martínez, J. & Sánchez , E. 2013. 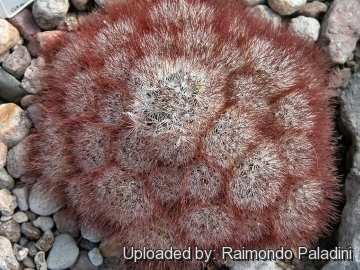 Mammillaria marcosii. The IUCN Red List of Threatened Species 2013: e.T40840A2936060. Downloaded on 31 March 2016. 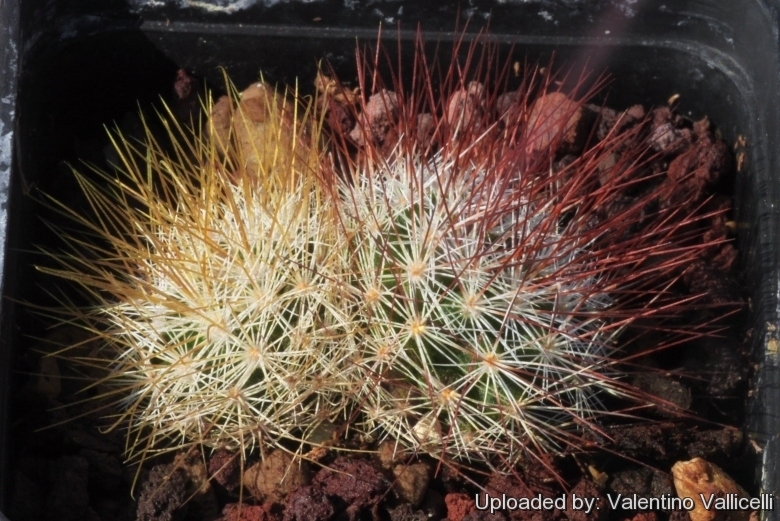 3) Fitz Maurice, W. A., Fitz Maurice, B. and Glass, C. “A new species of Mammillaria (M. marcosii), Series Stylothelae, from northwestern Guanajuato, Mexico.” Cactus and Succulent Journal (US) 69(1): 10-14, ills. 1997. 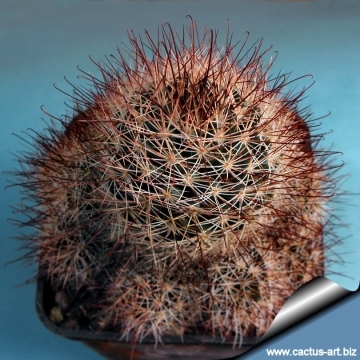 4) Fitz Maurice, W. A., Fitz Maurice, B. and Glass, C. “Repercussions - Mammillaria marcosii.” Mammillaria Society Journal 37(4): ?.1997. 5) Hunt, D. “CITES Cactaceae Checklist”, 2nd ed. Royal Botanic Gardens, Kew and International Organization for Succulent Plant Study (IOS). 1999. 6) Pilbeam, J. 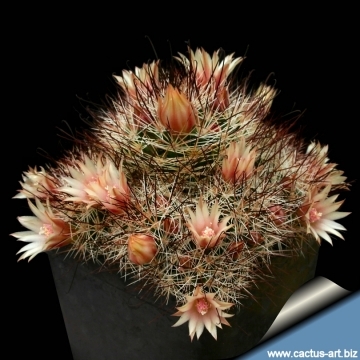 “Mammillaria.” Cirio Publishing Services, Southampton. 1999. 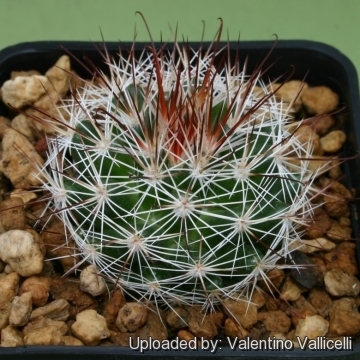 Cultivation and Propagation: Mammillaria marcosii isn't famous for being easy to cultivate, but in good conditions with excellent ventilation, it grows without difficulty. It is especially sensitive to over-watering. So careful watering and an open mineral potting soil are a must. Avoid the use of peat or other humus sources in the potting mixture. Don't add limestone to the potting mix, which must be moderately acidic. Can be sensitive to frost. Requires maximum sun exposure to reach its full potential. and in order to achieve success in flowering. A winter rest that allows the plant to shrivel will encourage flowering and long term survival. Be careful to encourage slow growth.